I thank, Mr. Sameer Goyal to sparing time for answering ‘student review interview questions’. Here is, what he expressed (without a single word editing). 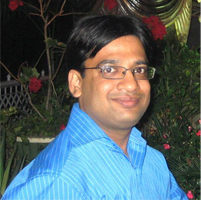 Sameer Goyal is passionate blogger and working hard to taking his blogging business to new heights of success. I wish him all success !! I already studied online a lot about SEO and Online Marketing. Unfortunately, there were many contradictions. In addition to that, I didn’t find the way of practical implementation and case study. Why did you decide to join Internet Marketing Course? I decided to join Internet Marketing Course so that I can establish my blogs in the niche market. How did you hear about Quibus Trainings? I came to know about Quibus Trainings through Google SERP. How did you decide to join Quibus Trainings for Online Marketing Course? I had a long meeting with Mr. Parmveer Singh Sandhu (my trainer at Quibus Trainings) before joining the course and discussed these aspects with him. His answers were the concrete answers, vision was very clear and the approach was very practical. On behave of that meeting, I decided to join him. How was your experience with your trainer? It was a great experience. Whatever he taught as per course schedule was updated. Moreover, his approach and dedication on the case studies and the real time problems, often brought by me and my class fellows, were amazing for me. Overall, my learning experience was wonderful with him. Tell something about your training experience. It was like opening a new world – the world of opportunities in blogging industry, the new world of new visions and ideas. The training was properly organized to let you learn SEO and Online Marketing from very starting to in-depth level. The most important part of the training was, it made us able to analyze, understand and adopt the changes come in existence in online marketing with the time. How this training helped you to address your problem? The training helped me to address and solve my problem by the individual case study sessions supported by my trainer during the course. Also Read:5 Startup Marketing Problems & Why Internet Marketing can Solve them? What is the best thing you want to share about this course & Quibus Trainings? Isn’t it showing the perfection and grip of Mr. Sandhu on online marketing? What one improvement would you suggest Quibus Training? Being a Vlogger, I suggest including some part of online marketing for video content in the course, so that the marketing at 2nd largest search engine (Youtube) can also explore in more strong way. What would be your suggestion for those who also want to learn Digital Marketing? I’m grateful to my trainer because his support is still continuing without any charges to solve the problems whatever I face during working. If you are going to learn Digital Marketing, be sure it’s not about tricks. It’s not about some magic which should make your blog topper and you a millionaire in just one night. It’s even not just about the lot of traffic driving. So, if anybody promises you all these things, please be cautious. Digital marketing is actually all about to work legitimately, with ethics, to establish your blog in semantic way in your niche market, to make you topical authority with the great focus on conversion which certainly makes your blog topper and you a millionaire with the time. Last but not least, these ethics of online business are getting taught in Quibus Trainings. I pay my sincere thanks for Quibus Trainings and Mr. Parmveer Singh Sandhu to provide me a helping hand.